Am I the only one who worries about data? 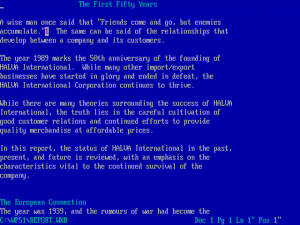 In grade 5 (this was in the 80s), I was one of perhaps two kids that typed up my projects in a word processor. Night before a project was due, WordPerfect 4.2 froze on me, and the 286 I was running it on wouldn’t boot again, and my work was lost. I had actually printed it, and handed in a marked up draft. But an important lesson was learned, very early – keep backups. Note here how resilient the daisy-wheel printed draft was, and how fragile the PC was. Flash forward to current day. Most of the work I produce belongs to my employer – I see that data as their responsibility – what they lose costs them, they can back up the work I produce as they choose. I haven’t lost anything due to reasonable backups. But I’ve never dealt with fire, loss, or theft. I have little use for physical media. I live in an apartment and have little use or physical storage space for prints. So I’ve prioritized – I have little work or correspondence to back up – all of the physical stuff sits in the top drawer of a small filing cabinet. I hope for the best for important documents. Photos of events are shared online – not much use for prints. Or is there? I had been copying camera flash cards to a hard drive and optical media. The optical media is brand name and stored in a dark place, but I still don’t trust it. I’ve seen photos of myself as a child – I think my daughter deserves the same. “Oh, Nameless Manufacturer put out a bunch of drives with buggy firmware in 2009 which ate your first step photos” isn’t going to cut it for me as an excuse. What about music? I’m still pretty old school – the indie record store across the street shut its doors last year – but I still buy CDs. Prior to a 2009 hard drive crash, I never backed up my MP3s thinking, “I’ve got the original on CD”. But I don’t have the time I did as a student – ripping 100s of CDs takes A LOT OF TIME. As for iTunes – I had fun as a teen flipping thru my dad’s LPs – I don’t think any child born in 2010 will get the chance to hear the music of their parent’s youth (I can imagine “I bought that album BEFORE Apple removed DRM” or “the Avril Lavigne hard drive must have crashed in 2005”). Hard drives are pretty cheap these days – the last time I bought a drive, I bought two, and set one up to copy over to the other once a week. The stuff on the 2nd drive never gets deleted – so if I accidentally delete a folder on my working drive, I can get it back on the the 2nd (point in time back ups). I run Linux at home, and use a little app called Back In Time to accomplish this task. The last time I looked at this from the Windows side, there was an application called “Dantz Retrospect” that seemed to get a lot of these things right – it seemed like the perfect solution for a small office (I think they’ve since been bought out by EMC). Of course, as important as making backups is making sure you can restore them. I have to say, I’m not that forward thinking. I think I need my own IT employee at home to think this thru. Backups is actually something I think Apple does best for home users (but, perhaps, still not well) – I think Time Machine is probably the best thing to happen to the masses who don’t really have the time or interest in worrying about this stuff. This still doesn’t cover loss due to fire or theft. Fortunately, online storage is pretty inexpensive these days – cheap enough for the data I create, still too expensive and slow for the music and video I consume. With Linux, I use s3fs to backup my work to Amazon’s S3 online storage service – it costs me a couple dollars a month. On the Windows side, I haven’t tried either of these solutions but did come across JungleDisk for Amazon S3 backups and mozy.com in previous searches.